Four or five years ago, gaming monitors were pretty expensive. Picking up a single gaming feature, like 144Hz refresh rate, might have tacked-on more than $100. Using anything besides TN panels was virtually impossible. Other panel types had miserable gaming performance, and were grossly more expensive. But time has a way of working things out. 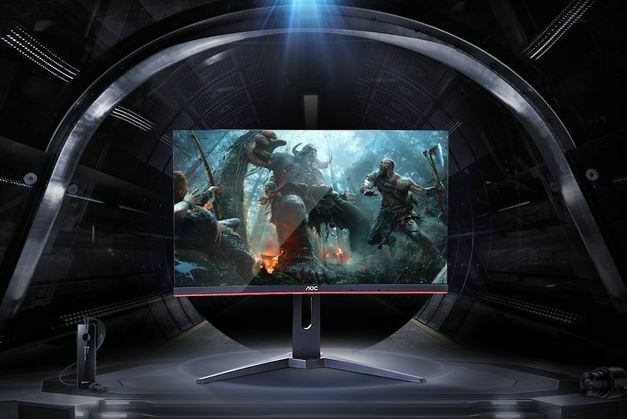 These days, you can get a gaming monitor with essentially every gaming feature there is, and end up paying the price of a pretty ordinary monitor. Luckily, now there seem to be only two or three features that can still make a gaming monitor expensive. Among AOC’s recently released G1 series, the CQ32G1 is the largest of the bunch. Its slightly smaller cousins have nearly all the same essential gaming features, but every one of them is limited to 1080p. In addition to offering 1440p, the 32” Class Curved Gaming LED Monitor is among the most affordable curved gaming monitors on the market. From one feature to the next, the AOC CQ32G1 checks off all the boxes on the list of things a gamers need from their monitor. These game-facing features are mostly about helping everything run together smoothly. Whether you’re playing a competitive shooter or an immersive story game, they bring you one step closer to where you want to be. But there are also a handful of competitive advantages to be had as well. Larger screens tend to weigh proportionally more, and a 32” panel is definitely on the larger side for gaming monitors. Measured diagonally, the AOC CQ32G1 is a 32” LED monitor. Straight across, there’s 31.5” of viewable screen space. And when you’ve got the stand attached, the AOC CQ31G1 weighs roughly 16 pounds. That makes it potentially less portable for someone who’s interested in taking their monitor on the go, like an avid fan of LAN parties. Conversely, its weight isn’t difficult to overcome when it comes to wall mounting. Managing to stay underneath 25lbs, the AOC CQ31G1 can be safely sustained by even some of the flimsier VESA mounts on the market. Curvature is still a fairly new thing among gaming panels, especially among panels with more approachable pricing like the CQ32G1. That’s because curvature is something that’s most effective on larger screens. It’s almost pointless to use on smaller 27” panels. The absolute smallest at which you should consider curvature is roughly 32”, the size of this panel. Sitting in front of it, one of the first things you’ll notice about the AOC CQ32G1 is the smooth 1800R curvature. Properly positioned, it helps to evenly match your eyes with the edges of the panel, giving you a much greater sense of immersion within the screen. Whether or not you’ll love curvature is really hard to predict without trying it. There are quite a few different variables involved, most notably perhaps is the distance you’re sitting from the panel. 1800R curvature a fairly aggressive curvature, it’s intended for someone who’s sitting only a few feet away from their monitor. The perfect position for viewing would be somewhere between two and four feet away. And as you pull away further from that, you’ll find curvature really does less and less. When it comes to gaming features, you’re probably looking for three things. A higher refresh rate, a lower response time, and dynamic sync. The AOC CQ32G1 delivers 1ms response time, which is pretty impressive for a VA panel. When you’re playing fast-paced action, it’s response time like that which help create a greater sense of smooth motion. Back in 2014, a 144Hz refresh rate was a fairly expensive feature. In the time since, it’s become almost trivially non-expensive. And that’s great because once you’ve used a 144Hz monitor, you really can’t go back to using 60Hz equipment. It helps allow you to see up to 144 frames per second, which really unlocks the potential of your GPU. Then there’s dynamic sync. The AOC CQ32G1 uses AMD’s FreeSync technology. It essentially works by proactively matching up the refresh rate of your display to the output of your GPU. When your GPU is producing 87 frames per second, the CQ32G1 will adapt to show those frames without screen tearing. Sort of like a hardware-based V-sync feature, helping everything to run smoother. Making practical use of FreeSync is another matter. Because the smoothness of 144Hz, you generally don’t see the effects of FreeSync unless you drop towards 50FPS or lower. Once you do, you’re glad it’s there. But perhaps more importantly, the best part about FreeSync is that the feature adds virtually zero cost to a panel. By contrast, NVidia’s dynamic sync technology can tack-on nearly $100. For many years, VA panel and gaming monitor did not belong in the same sentence. But the AOC CQ32G1 is a vertical alignment (VA) panel. And that’s mostly reflective of the long way that VA panels have come over the last few years. TN panels are responsive, which made them a favorite among gamers. But they also have by-far the worst color reproduction of any LCD panel. By contrast, the VA panel used by the CQ31G1 has excellent color vibrancy, as well as far greater viewing angles. Those viewing angles are slightly contradicted by the curved nature of the screen. But even if you’re not getting the full benefit of the curve while viewing, the VA panel can keep colors sharp and clear. 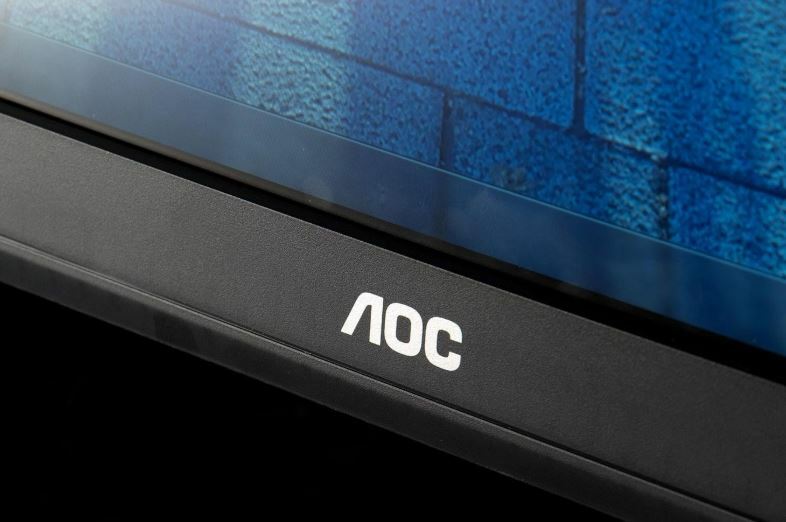 The AOC CQ32G1 32” Gaming Monitor delivers 2560 x 1440 native resolution, also known as 1440p. For choosing the right resolution, your decision is always relative to screen size and viewing distance. But like with its curvature, 1440p is a perfect match for a 32” panel. The total number of pixels per inch works out to roughly the same visual fidelity as 1080p content on a 27” panel. Additional standards supported by the AOC CQ32GQ include 16:9 aspect ratio both, and a bright-and-even 300cd/m2 brightness from the backlighting. With the use of technological trickery, AOC is able to claim a dynamic contrast ratio of 80,000,000:1. But those performance metrics are somewhat exaggerated. To get truly exceptional contrast ratios, the kind which are ideal for cinematic experiences, you need a monitor that’s made specifically for cinema. Such a panel might include independent lighting-zones within the panel, HDR support, and a greatly expanded color gamut. But features like these have either not yet found their way onto gaming panels at all, or have not done so without astronomical prices. AOC’s Flicker-Free technology is somewhat standard on mainstream monitors these days, or really any good monitor made in the past ten years. It helps reduce the strain and discomfort caused by blue light. Blue light specifically is associated with eye fatigue, and a variety of sleeping problems. Developing a sleep issue isn’t going to make you have any more fun gaming, and it certainly won’t make you a better player. Essentially, this feature is a nice optional thing you can flip on if your eyes begin to feel tired. What happens in a few years if you buy a new GPU? The AOC CQ31G1 has you covered because all the basic formats are covered. For starters, this panel does its part to keep the old VGA format alive. If you’re using a lower-end GPU, that’s a good thing. There are also a pair of HDMI 1.4 ports, and a solitary DisplayPort. And that covers all your basics, whether you’re using a high end GPU or something a little simpler. You’ve got essentially every type of port connection you could conceivably need on this panel for perhaps a decade. A final detail to note. There’s also a single earphone jack placed on the side of the bezel, helping you connect headphones without having to run a wire to your PC. The CQ32G1 is limited only in that it’s made specifically for gaming. If you were looking for a cinematic monitor, you might want features like HDR+, or you might want to seek a panel with a color gamut that exceeds cinematic standards. Those types of features still have hefty price tags attached, which put them well out of reach of the AOC CQ32G1. On that note, the FreeSync supported by the AOC CQ32G1 Monitor is the original version, not FreeSync 2. The updated version involves support for HDR. 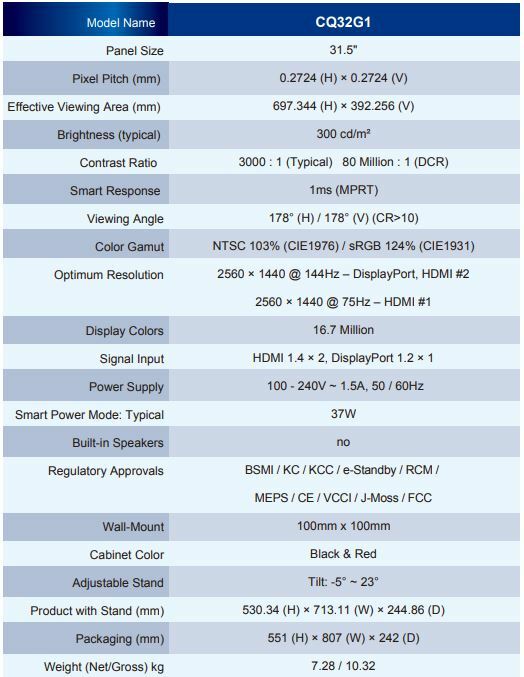 Sooner or later HDR will make its way onto a gaming monitor like the CQ32G1, but for the time being, expanding the color gamut in that direction would explode the price of the panel. Curved panels are probably not the right selection to hang on the wall of your business. If a friend came over to watch a movie, you might find the curvature getting in the way. However, these are niche circumstances. As long as you keep in mind the AOC CQ32G1 is intended to be used as a gaming monitor, you’ll probably be glad the curvature is there. The AOC CQ32G1 is wall mountable, and it makes use of VESA standard mounting brackets. That makes it pretty easy to apply to existing mounting equipment, or to find equipment suitable to get it mounted. And it includes a three-year warranty from AOC. 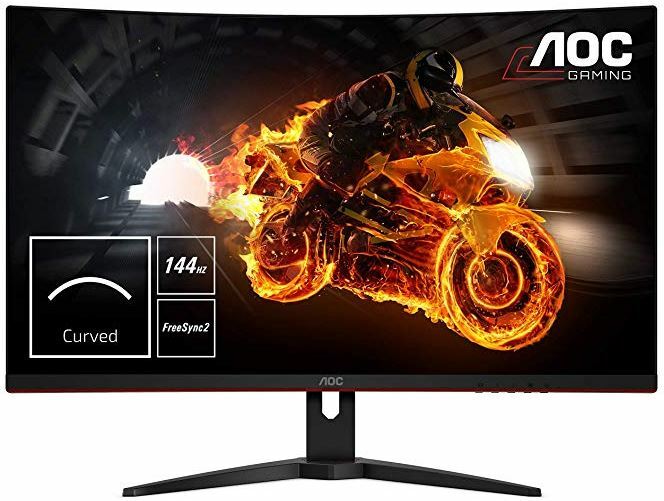 Who Should Choose the AOC CQ32G1 32” Class Curved Gaming LED Monitor? The AOC CG32G1 is a top-shelf gaming monitor with a mid-range price. In every domain that matters, you nearly cannot do better for gaming. From the smooth refresh rate, to the swift response time, to the inclusion of FreeSync, this panel packs almost everything a gamer could ask for. If you wanted to go larger than 32”, you’d want to switch to 4K resolution. To keep all these gaming features at that resolution, you’d have to add a zero to your budget. Really, a 32” panel is about as big as most people want a monitor to be. And applied to watching movies, the AOC CG31G1 is more than passable. The VA panel and dynamic contrast ratio help deliver above-average cinematic performance. The AOC CQ32G1 covers all your bases. For FPS games, for exploration games, for story-based games, it’s great for them all. 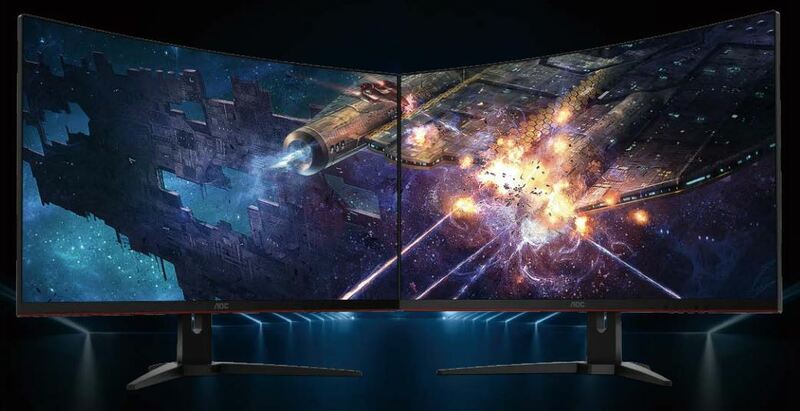 That makes this panel a pretty clear choice for anyone who’s an avid gamer, or just about anyone looking to take advantage of the huge leaps in monitor technology that have taken place over the past few years.